The hotel was in a beautiful surrounding, the terrace in the room was super quiet and nice, staff very friendly and the restaurant has amazing and tasty dishes! The bed and pillows were great, shower outside in the hot tub was great. Waiter at dinner was great, food was pretty good. The 'Ecological aspect' was just perfect to reflect real luxury. A good feel that makes you enjoy fully the stay. Très beau site, cadre intimiste parfait pour un séjour en amoureux. Le bungalow est confortable et bien pensé; petit coup de cœur pour le jacuzzi en terrasse. Le calme, le cadre exceptionnel, l’originalité de la décoration. On a carrément l’impression d’être seul au monde dans son bain à remous sur le balcon avec un ciel étoilé et pas un bruit. Tout est très propre, et assez sain. Lodge Roche Tamarin This rating is a reflection of how the property compares to the industry standard when it comes to price, facilities and services available. It's based on a self-evaluation by the property. Use this rating to help choose your stay! One of our top picks in La Possession.Village Nature offers far-reaching views of the Indian Ocean from its tropical forest setting. It features a spa with hammam and sauna and an outdoor swimming pool with shaded seating areas. Each bungalow features its own balcony with sea views. A flat-screen TV with satellite channels and an electric kettle are provided in each. Private bathrooms are equipped with amenities and a hairdryer. Breakfast can be delivered directly to guest’s bungalows. Guests can also dine in the hotel’s restaurant which enjoys panoramic views of Le Port. African dishes including grilled meats are served around a campfire in the evening. Rolland Garros Airport is a 30-minute drive from Village Nature. Saint Denis is 8.7 mi away. Free parking is available on site. When would you like to stay at Lodge Roche Tamarin? This bungalow has a private hot tub on its own terrace. 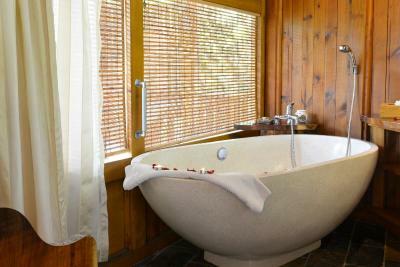 This suite has a spa bath, air conditioning and hot tub. House Rules Lodge Roche Tamarin takes special requests – add in the next step! Lodge Roche Tamarin accepts these cards and reserves the right to temporarily hold an amount prior to arrival. The restaurant a little expensive but food was great though. Inside shower was hard to use and sprayed water all over the bathroom. The pool was dirty and the deck boards were pulling up. Just very overpriced for what you get. Overall, really bad experience, definitely not worth the high prices. We booked a lodge prestige room (with hottub outside) for 3 nights for our honeymoon. The room and facilities look great in the photos but are far from it in reality. The room was old small and dank and felt like being inside a boat cabin. The bed was horrible. Uncomfortable, small, and didn't feel clean. The room has a bath (no shower) with nothing preventing the water from splashing all over the place. It looks nice but extremely not practical. The dinner restaurant was VERY expensive, but the food was ridiculous. Seems like they are really trying to brand it as a gourmet restaurant, but they are really overdoing it, and very distastefully. The result is colorful dishes where nothing makes sense together, and most of the ingredients even by themselves taste akward. Breakfast wasn't good quality either. And each morning when we came (at different hours) we needed to ask the staff to re-fill the buffet. Wi-fi reception in our room was barely functional. The pool is tiny , much smaller than it looks in the photos and also doesn't look like it's maitianed regularly. Staff not so friendly, beds super hard and not comfi and ants in our drinks with breakfast. Cosy tiny houses with nice bathtub.